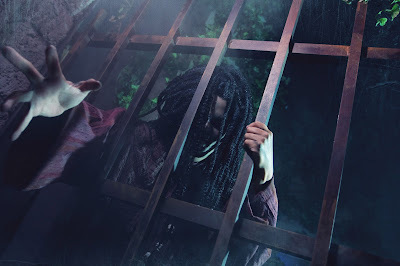 Busch Gardens Howl-O-Scream 2013 - Death Water Bayou is one not to miss! Last Friday night, Gabe and I visited Busch Gardens Howl-O-Scream. The theme for HOS is Evil 13 - Once every century, on precisely the thirteenth year, evil comes out to play. Upon entering the park, we were greeted by the evil 13, behind closed doors in the center of the park. Gabe and I quickly headed over to Death Water Bayou, one of the new houses in 2013. Death Water is a house located deep in the bayou with a homage to New Orleans. The details in this house are off the chain. Upon entering the house, you are greeted by the Voodoo Queen, who is part of the Evil 13. 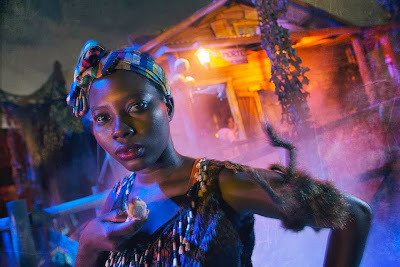 From the Busch Gardens website - The Voodoo Queen mystically transforms lost wanderers into her minions of evil with black magic. Here, her night servants roam with a zombie-like hunger and seek to grow her collection. The darkest evils lurk in shadows. Get out before you fall victim to her spell. The details inside of Death Water Bayou were very impressive. There was a Second Line funeral march to the above ground graves, even a room that was based on Bourbon Street. I don't want to give too many details away but I can honestly say, this was my favorite haunted house in Howl-O-Scream history and I beg you Busch Gardens, keep this one on the lineup. 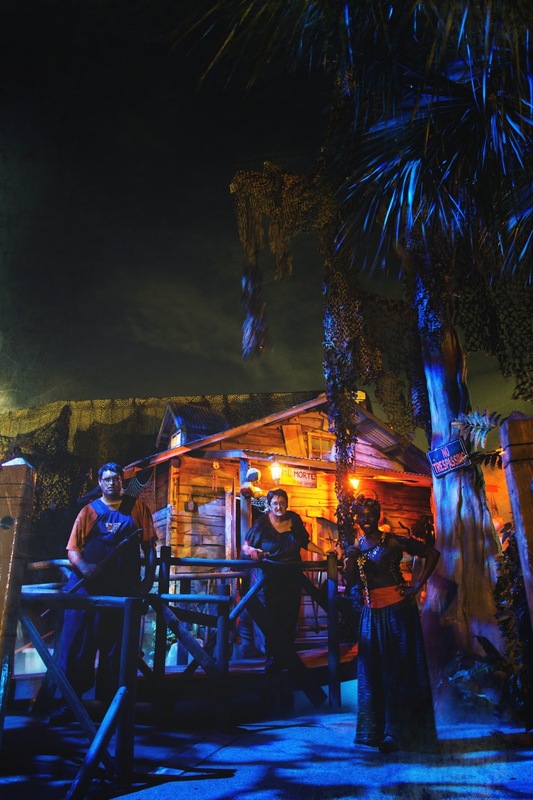 We were fortunate enough to have a second engagement shoot at Busch Gardens inside of Death Water Bayou, taken by the very talented Joe Roberts from Roberts Imagery. I will have those photos posted on here very soon! Let's just say, we made nice with the Voodoo Queen and a few zombies. All of the other houses at Houses we entered were impressive and we are hoping to visit HOS once more before it ends. The event then runs Thursday through Saturday nights, Oct. 3-5, 10-12, 17-19 and 24-26. Operating hours are 7:30 p.m. to 1 a.m. on all event nights. From Busch Gardens’ press release: 335 acres will be overgrown with dark, sinister, adult-targeted fun, including new haunted houses, scare zones, a thrilling live stage show and the chance to ride adrenaline-fueled coasters in the dark, including Florida’s first triple-launch coaster, Cheetah Hunt. Even the streets themselves aren’t safe with all-new scare zones, led by the 13 evils that have been waiting a century to come out and play for the most horrifying Howl-O-Scream ever. It will leave you begging for mercy… and screaming for more. With that said, I leave you with a video taken from the ever popular Fiends "Naughty Nurse" show.